On March 25,1995 Pope John Paul II issued his “Evanggluim Vitae because he believed the Secular World was promoting a culture of death not a culture that recognizes the sanctity of life from conception to natural death. The Encyclical is very long so I will include only those quotes that relate to the theme of this Blog. “The Second Vatican Council, in a passage which retains all its relevance today, forcefully condemned a number of crimes and attacks against human life. Thirty years later, taking up the words of the Council and with the same forcefulness I repeat that condemnation in the name of the whole Church, certain that I am interpreting the genuine sentiment of every upright conscience: “Whatever is opposed to life itself, such as any type of murder, genocide, abortion, euthanasia, or wilful self-destruction, whatever violates the integrity of the human person, such as mutilation, torments inflicted on body or mind, attempts to coerce the will itself; whatever insults human dignity, such as subhuman living conditions, arbitrary imprisonment, deportation, slavery, prostitution, the selling of women and children; as well as disgraceful working conditions, where people are treated as mere instruments of gain rather than as free and responsible persons; all these things and others like them are infamies indeed. They poison human society, and they do more harm to those who practise them than to those who suffer from the injury. Moreover, they are a supreme dishonour to the Creator”. “Unfortunately, this disturbing state of affairs, far from decreasing, is expanding: with the new prospects opened up by scientific and technological progress there arise new forms of attacks on the dignity of the human being. At the same time a new cultural climate is developing and taking hold, which gives crimes against life a new and-if possible-even more sinister character, giving rise to further grave concern: broad sectors of public opinion justify certain crimes against life in the name of the rights of individual freedom, and on this basis they claim not only exemption from punishment but even authorization by the State, so that these things can be done with total freedom and indeed with the free assistance of health-care systems. All this is causing a profound change in the way in which life and relationships between people are considered. The fact that legislation in many countries, perhaps even departing from basic principles of their Constitutions, has determined not to punish these practices against life, and even to make them altogether legal, is both a disturbing symptom and a significant cause of grave moral decline. Choices once unanimously considered criminal and rejected by the common moral sense are gradually becoming socially acceptable. Even certain sectors of the medical profession, which by its calling is directed to the defence and care of human life, are increasingly willing to carry out these acts against the person. In this way the very nature of the medical profession is distorted and contradicted, and the dignity of those who practise it is degraded. In such a cultural and legislative situation, the serious demographic, social and family problems which weigh upon many of the world’s peoples and which require responsible and effective attention from national and international bodies, are left open to false and deceptive solutions, opposed to the truth and the good of persons and nations. Despite this admonition there those within the Catholic Church and many who hate the Catholic Church, who believe that abortion is a non-issue in elections. 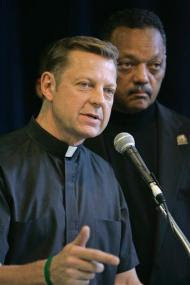 People like “Father” Pfleger(defender of Louis Farrakhan) and a few liberal Bishops have advocated the election of Obama/Biden. Both of whom are supporters of abortion and late term abortion! Now we learn that Billionaire George Soros, in addition to a supporter of Obama, is bankrolling liberal Catholic groups that support abortion. An investigation by the New York-based Catholic League for Religious and Civil Rights finds that George Soros’ Open Society Institute gave Catholics in Alliance for the Common Good $50,000 in 2005 and $100,000 in 2006.Soros defines his concept of an Open Society as:”An open society, in my definition, is an imperfect society that holds itself open to improvement”. This includes being tolerant of new ideas and different modes of thinking and behavior! 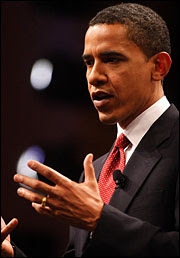 No wonder he backs Obama and abortion rights “catholica”. Catholic League president Bill Donohue suspects that Soros may also be funding the group Catholics United, an organization with which Catholics in Alliance has a formal relationship. Donahue contends both groups are “in the pocket of the Democratic Party” and are trying to sell Catholics the notion that they can be opponents of abortion and not seek to overturn Roe v. Wade if they support minimum wage and more welfare benefits. “Why is this relevant? Because this same bigot is connected to two apologists for abortion rights, Catholics in Alliance for the Common Good and Catholics United. In 2006, Soros’ Open Society Institute gave Catholics in Alliance $100,000 (double the amount he gave in 2005), and in the same year Catholics in Alliance listed Catholics United on its 990 as an organization with which it has a formal relationship. John Podesta, White House Chief of Staff under President Bill Clinton from 1998 until 2001,who runs the Soros-funded organization, Center for American Progress, admits that he works closely with Catholics in Alliance and Catholics United. The Center for American Progress is also the sponsor of Faith and Public Life.Illinois born Podesta is presently head of the Liberals much anticipated Transition Team for Obama! “Why would any Catholic organization take money from a man like George Soros? Because legitimate sources of revenue aren’t available? And why would Soros have any interest in funding Catholic groups? He doesn’t give the Catholic League any money, and if he offered, THEY would refuse it. All those who believe in the Ten commandments must recognise that abortion is the modern day genocide of tiny infants who should be in the most safe place in the world, a mother’s womb! It is high time to stop pretending that we do not know what this nation of ours is allowing—and approving—with the killing each year of more than 1,600,000 innocent human beings within their mothers. We know full well that to kill what is clearly seen to be an innocent human being or what cannot be proved to be other than an innocent human being is as wrong as wrong gets. « ECONOMIC TRAI WRECK IN THE MAKING!